Belt or vibrating sorting tables, placed after de-stemming, are designed to eliminate petioles, stems, spoilt and shot grapes, and insects from the grapes. PMH Vinicole has two grape sorting tables models available. The table has a smooth conveyor belt made of food-grade PVC, which wraps around two axes and allows the grapes to be sorted at a selected speed. This grape sorting table has two different belt widths, 600 and 800 mm, and a belt length from 3,000 to 8,000 mm, according to the number of people who will be sorting. The table’s vibration allows the grape to be spread out in order to facilitate sorting. The horizontal vibrating table mounted on “silent blocks” is equipped with perforations and a drip tray for the first juices. 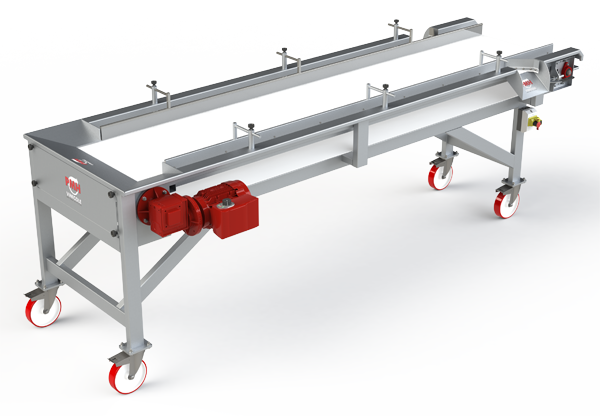 Beneath this sits a juice collection tank, mounted on the chassis together with a transitional grating to collect small foreign bodies.This model enables the draining, equalisation and sorting of the grapes. This sorting table is 750 mm wide and has a length from 1500 to 5000 mm, according to the number of people who will be sorting.